each with their own sense of justice. Dydroit Belt is the location for chapters 66-69 of the main quest. A giant archipelago straddling multiple skydoms located beyond the Grim Basin. It's composed of giant crags held together as one by the power of the primal beast Kikuri. 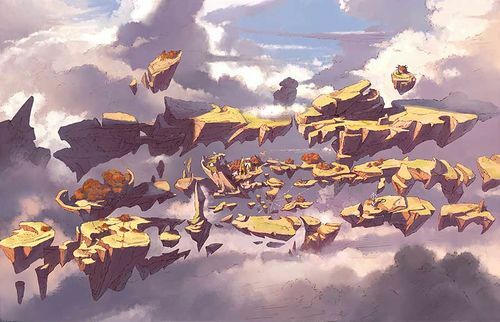 Within each skydom area the Dydroit Belt covers, there is one main city, but the people are mostly merchants and explorers with long-term residents few and far between. 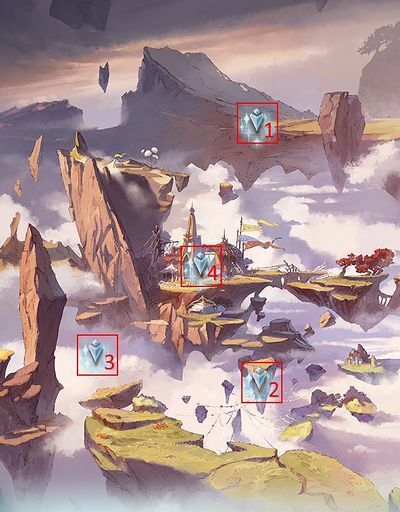 Although it's one of the few places where you can reach neighboring skydoms without using an airship, anyone, excluding the Seven Luminary Knights, who dares to enter the Grim Basin must be reckless in spirit. A city on the Dydroit Belt within the borders of Phantagrande. With few people able to cross the Grim Basin, there are many similar cities throughout the Dydroit Belt for every skydom it covers. Its market sells curious items from various skydoms, appealing to buyers and exploratory teams alike. With its immense and rugged terrain, this group of rocklands along the outskirts serves as a shield for all life in the Dydroit Belt, protecting them from the rough winds on the Grim Basin border. A dense collection of small rocklands on the inner-side of the Dydroit Belt. As the winds are more stable than the outskirts, many outposts are built here for exploration and other duties. However, the Dydroit Belt is not meant to be inhabited, and extended stays here are not common. An expanse of white clouds in the lower area of the Dydroit Belt. On particularly windy days, the islands of the belt become enveloped in white with no visibility, postponing any outdoor exploration or other duties. A rocky mass that forms the belt's border, where strong winds whip up white clouds. One of the major inner-rocklands, where long-wandering seeds take root. Massive Wind damage to one ally. TR only: Increases skill cooldowns by 3 turns for the targeted ally. Large Wind damage to all allies. Wind damage to all allies and removes all buffs. Increases buff skill cooldowns by 3 turns for all allies. Chance to inflict Lethal HitInstant death for the victim. Massive Dark damage to all allies and removes all buffs. Drop table last updated: 2019-01-23, all stated drop rates are estimates. Ties are severed and new fates are spun. The desire to connect shall only temper the binds of fate. 42 hits of ~700Verification needed. Light damage to random allies. All Weapon Skills are disabled. All Summon Auras are disabled. Drop table last updated: 2018-01-10, all stated drop rates are estimates. 1500 Plain damage to all allies. Plain damage to one ally based on 95% of ally's current HP. Plain damage to one ally based on 80% of ally's maximum HP. ~50,000 Light damage to one ally. Shares mode bar with Qilin. Normal attacks hits two allies. 3000 static Plain damage to all allies. Plain damage to one ally based on 30% HP. Multi-hit, multi-elementAlso includes Plain damage damage to random allies . 40Verification needed. hits of 300 static Plain damage to each allyVerification needed. and removes all buffs. Shares mode bar with Huanglong. Drop table last updated: 2018-11-26, all stated drop rates are estimates. Location: Chapter 69: Dydroit Belt - South Cliff, Dydroit Belt Start QuestNetwork Errors will appear if the hosting conditions are not met. Strength: 100,000 HP / turn. Warning! Does not work for Plain Damage! upon next attack on all allies. Removes one debuff from self and removes all buffs on all allies. Water damage to all allies and removes all buffs. Cannot be removed with Dispel.